Now, do keep in mind that some posts (especially when I feature someone else’s work or blog) may have photos that are NOT mine. I ask permission before using other peoples photos, but I can’t give you permission to use them too. Most of the photos (including the ones of Dr Shirazi’s collection) are mine. If you are unsure about something, email me for permission – I love email, I really do. I love talking to readers. Now, I have a present for all y’all Pinterest folks. Wikimedia Commons! It’s a database of 12,443,168 freely usable media files to which anyone can contribute. A lot of them are public domain, and all the images have information about copyright permissions or restrictions right there on the page so you can easily determine whether you can use it. Hurray! Knock y’all-selves out! There are tons of absolutely gorgeous images! Like the one above – wouldn’t it be gorgeous embroidered, maybe even with lace or organza embellishment? 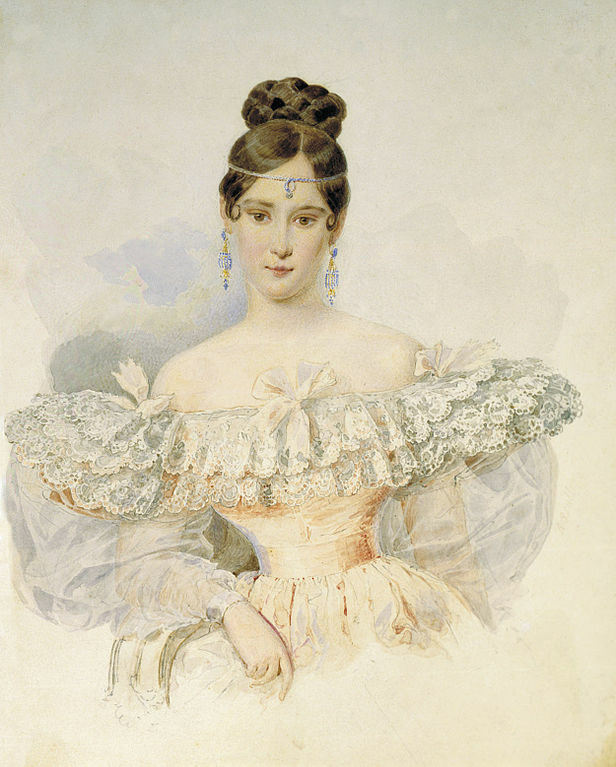 It’s a portrait of Natalia Pushkina (Nataliya Nikolaevna Pushkina), wife of a famous Russian poet. She was accused of cheating on him, and he died in a duel with her alleged lover. It’s also rumored that she was the mistress of Tsar Nicholas I before her remarriage to a Major-General. You can read about her in this Wikipedia article. She is definitely a gorgeous woman, but can you imagine trying to keep all that froth and lace up? Look how wide it makes her shoulders look – I know, it is deliberate, to make her waist look tiny and doubtless exaggerated for the portrait. But still my mind can’t cope with the idea of having all that weight horizontally across the tops of your arms, you’d be scared to move a muscle, which clearly she wasn’t, lol. I don’t think I’m up to managing that outfit either, as beautiful as it is! The frock would be held up by lacing, and what would worry me would catching my death of cold in the draughty houses of the time! Hannah, thank you for clarifying your position about all this. I need to think about this and be equally explicit! Well, while you’re thinking about it, I’d just like to mention that some of the blog posts concerned about Pinterest have had some misinformation. Here’s their copyright page – http://pinterest.com/about/copyright/. First off, Pinterest does NOT own your photos if your photos are on there. You still have copyright. They mention the word “perpetual” mostly because they don’t want to keep a timer on each photo’s permissions, and “worldwide” so they don’t need to black out parts of Pinterest depending on where users are visiting from. Also, they don’t want photos randomly disappearing from pinboards. Well, if the Tsar is paying the heating bills I guess that’s not a problem! My God, isn’t she pretty?